ClubCoins Needed: 190 Please note that this item is not available on your device. You may add the item to your Wish list and redeem from a compatible device. LEARN THE SALES SECRETS THAT GET RESULTS! 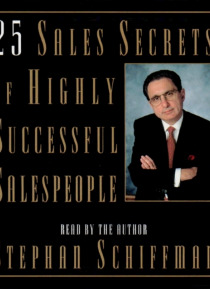 25 Years Secrets of Highly Successful Salespeople is a must-listen for all salespeople. Stephan Schiffman, America's Number One Corporate Sales Strategist and President of D.E.I. Management Group, an international sales training and consulting firm, shares with you the 25 traits that will distinguish you as a high efficiency salesperson. Steve's pragmati… c ideas range from how to be a "e;consultant"e; to your prospects, to asking for the next appointment while you're on the first visit. 25 Sales Secrets of Highly Successful Salespeople is a practical, results-oriented guide to selling.